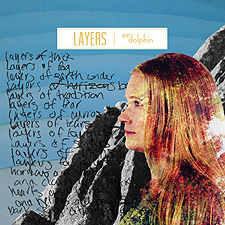 For those not in the know, Layers is the quite brilliant debut album from San Francisco indie rock band, and fantastically-named ensemble On Dolphin. Featuring Melissa Lyn, along with Anderai Maldonado (bass), Nathan Dennen (keys) and Ryan Clark (drums), the band's music has been described as "Indie rock for people that are hopeful and curious". Exploring the evolution of ideas from curiosity and experience to belief's and knowledge, finding comfort within the structures of family and community whilst making space to be, Layers begins with the folk trip "More Good Days" ("I need to see a little more, of everything, I need to feel a little more, of everything"), and follows that up with the more mellow "Dance In The Kitchen", the foot-tappin' title track "Layers", and the drive time storytelling of "Worth The Drive". The sublime "New York" is one of the true stand out highlights on this album for me and showcases On Dolphin, as an ensemble, quite like no other track dare come close to. Lyn's vocals are lush, the orchestration behind her simplistically perfect, the created sound, as a whole, just perfection. The acoustic guitar work and raw drum combo of "Inventing Fences" is refreshing also, and that is followed by both the subdued indie rocker "Together" and the fanciful "Laugh It Off". This excellent debut album - I mean seriously, how does a debut album turn out this bloody good these days?! - is then brought to a close with the gentle acoustic guitar, finger strummin' play (from Lyn) on "Slowdown", before the last track, the stunning piano ballad "Let A Little Light" wraps the whole project up beautifully. With key work from John Elliott, the track is yet another prime example of just how good Melissa Lyn, and On Dolphin, are. Hopefully, by having now read this review, you have been educated in their ways, their sounds and are overly curious to check them out some more for yourself. I truly hope so for On Dolphin's music is, especially given that this debut album is also on a VINYL LP, music you definitely need playing in your front room on days/evenings like these. As for that noted VINYL LP, well, Layers has been released as a YELLOW vinyl with only 100 pressed. So, it is super Limited Edition in a super special custom package, and has been pressed on a premium 180 gram vinyl. It also includes a CD & free digital download of the full album, if you feel the need! But wait, there's more, for Layers has ALSO been released on high quality 180 gram CLEAR vinyl, which also includes a digital download of the full album!